Where are some of the best cafes in London that a foodie can visit? Contrary to popular and humorous derision of British food around the world, Britain has a wonderful variety of foods and flavours that you should try when you visit London. Fish and chips, pub crawls, curry tastings, international food bites, traditional British pies and of course the full English breakfast! 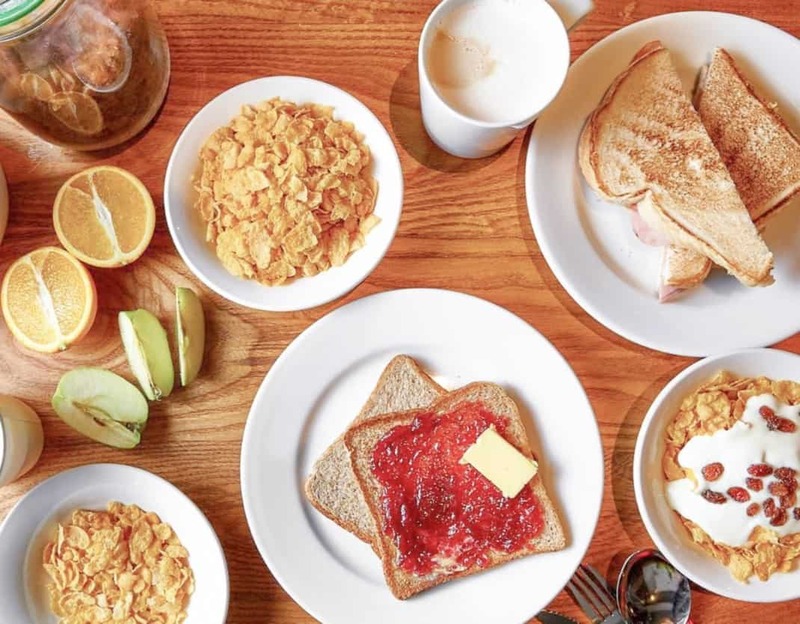 English or not, breakfast is the most important meal to start a day full of sightseeing and exploring, and the best cafes in London are the place to do it. Cafés are our saviour for our early needs: any type of breakfast item and a drink of your choice. a coffee, a juice, a smoothie and maybe a sandwich or a pastry to go along with it! Here are the 12 best cafes in London, enjoy the food adventure! Not very surprisingly, London has a bit of everything from all over the world in terms of cafes. Fancy a French pastry, some tapas for lunch, or maybe an Italian touch to your sandwich? You got it! This gives a very vibrant culinary scene to discover. So keep reading for the best cafes in London because you are about the get even more hungry after reading this! Kicking of our list of the best cafes in London is Pellicci. It’s an East London café that gives the customer the opportunity to enjoy a local vibe and old London days. The café was established in 1900 and run by an Italian family – it has been working over a century now! It is still a favorite place for locals but on the weekends you can see the travelers coming from all over the world. They have breakfast, lunch, pasta, sandwich and grill menu. You can visit anytime during the day to have a bite of delicious things and simply to experience the ambiance here. Note it down, their English breakfast and a cup of tea is only £8! Second on the list of the best cafes in London is J+A. It’s a cozy and nice café that prepares Irish home food and baked goods. The letters J+A stands for the first letter of the sisters’ names who opened up here together. This place is hidden in the downstairs of an old diamond-cutting factory. There is a lovely courtyard where you can enjoy your Irish breakfast, a soda bread and a cup of tea during a good weather. If you are in the mood, go for a fluffy cake and a carefully brewed filter coffee. You have many options to choose from! Good veggie one coming up! Attendant used to be a public toilet back in ancient times – it’s not a joke. However, when you see it now, it has changed pretty much in a better way. The café is decorated in a very minimalistic and modern way. If you are looking for a daybreak, Attendant is a very nice place to relax and drink a coffee. The café is especially very good option for a variety of different diets including vegetarian, vegan and gluten-free. Their coffee is sustainable resources, the menu is seasonal and focuses on high-quality ingredients. Don’t miss a chance to spend a good time over here! Drury has delicious pastries, yummy brekkies, tons of books scattered around and also a very smiley service. People keep going there because it is one of the best cafes in central London! Everything tastes very fresh, the pastry and sandwich display looks gorgeous from outside. It’s a perfect small café to have a breakfast in the morning along with a black coffee or simple for a light lunch. You’ll love the relaxing ambiance here, it’s basically like eating at home! English brekkie, here we come! Alarm! Traditional English breakfast alarm in the town! Kennington Lane is one the budget-friendly café still visited by many locals in the area, and it’s probably the best contender for a traditional English breakfast among this list of our best cafes in London. The portions are huge, the breakfast is perfectly delicious and you only pay £8 for a full English breakfast! You can also eat some snacks, lunch or dinner here like a lamb moussaka or a cheeseburger, the menu is more like a home-cooking style. Even though it gets pretty busy, the service never fails here –they smile, bring your food and make sure everything is fine on your table! Monmouth has been roasting coffee beans since 1978 in London. This amazing coffee shop is in the Covent Garden area. Londoners refer to this place as the best coffee in London, and it might be true, so we have to add it to our list of the best cafes in London! There is always a line in the café but it worths waiting. The smell of roasted coffee beans, sweet aroma of their croissants and viennoiseries are all around the place. You might end up having more one than one cup of coffee here! If you want you can also buy their roasted coffee beans directly from the café. Fig Tree is a quaint looking little café in Highbury. The whole place is covered with woods so it gives a feeling that you are in a faraway place from the city – in a mountain area. The backyard in the café also supports this feeling, you have a view of a very green and calming area that you can enjoy. The plates look like a rainbow; very colorful, fresh and always on point with the taste. Fig Tree offers you a great value for money, nicely portioned home-made food, fresh produce, attentive staff, and cozy atmosphere. Great option for a weekend break! Charlie’s is a small café located in Wood Green actually. Surprisingly has many amazing brunch and breakfast options – since it is pretty small inside! Both breakfast and brunch are served until 3 PM, which is great if you are a lazy sleeper, especially during the weekends. The takeaway options are also great: Smoothies, sandwiches with sourdough bread and pastries – and many more! You can also find vegan, vegetarian and gluten-free items on the menu very easily. If you want to talk about the hidden places who are very good at food but not very known by travelers, let’s talk about this. Brunswick East is one of them. The café is in the Dalston area. They serve local, organic and international style menu. However, they are known for their Aussie breakfast and Aussie foods too! There is a big courtyard which gets pretty amazing during a nice spring or summer night. Grab an espresso and come for a brunch here with some friends, you’ll like the vibe here – and the food for sure! Fast Break is a café that serves traditional breakfast. It has four other locations in different places in the city but starts from the best one which is on Old Street. The retro-looking café is great for any type of breakfast. Even you picky friends can choose something from the menu easily. There is an option for everyone, also for vegetarians and vegans too! The portions are quite big and the prices are super budget-friendly. Come here pretty hungry because you will want the eat the whole menu! Raison D’Etre adds a bit of French-style to our list of the best cafes in London, situated in South Kensington. The literal meaning of “raison d’etre” is actually the reason of existence. Basically, for the café owners, it is good food and good company. The menu has breakfast, light lunch and cheese platter options. From pastries, their viennoiseries are quite famous as well. If you don’t feel like having a breakfast – although you should sometime -, you can grab a sandwich or salad as well. They have a gluten-free option or sandwiches as well! Potentially leaving the best to last in this list of the best cafes in London, Regency Café is a very popular place and might be the most famous café in the capital. The place is always full of people having English breakfast along with a black coffee in their hands. A down to earth café, they are serving delicious food since 1946! Also, the prices are nothing like you would see in London! They have both breakfast and lunch& evening menu. The breakfast is mostly egg, bacon or sausage, beans, tomatoes, and the lunch menu is a type of meat or poultry and chips. This is where you’ll see many locals and tourist at the same time. Regency is a must-eat and visit café in London.